Trump To Speak At Hate Group Convention - Joe.My.God. Last year, he spoke to the Values Voter Summit as a candidate — this year, it will be as the 45th President of the United States. 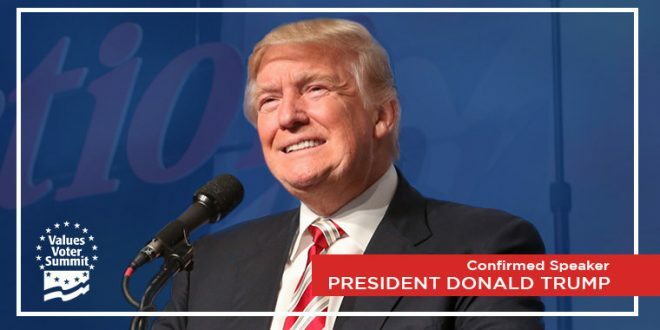 Today we have confirmation from the White House that President Donald Trump will speak to the VVS crowd this Friday morning. If you’re on the fence about attending, jump on over to the VVS website to secure your spot now! The October 13-15 event in Washington, D.C. is only a few days away, and President Trump won’t be the only newsmaker on the platform. You’ll hear from hero and House Majority Whip Steve Scalise (R-La. ), Reps. Mark Meadows (R-N.C.), Vicky Hartzler (R-Mo. ), RSC Chairman Mark Walker (R-N.C.), Chris Smith (R-N.J.), Dr. Bill Bennett, Dana Loesch, “Duck Dynasty’s” Phil Robertson, Laura Ingraham, Todd Starnes, Dr. Sebastian Gorka, Steve Bannon, Judge Roy Moore, Lt. Col. Oliver North, and more.